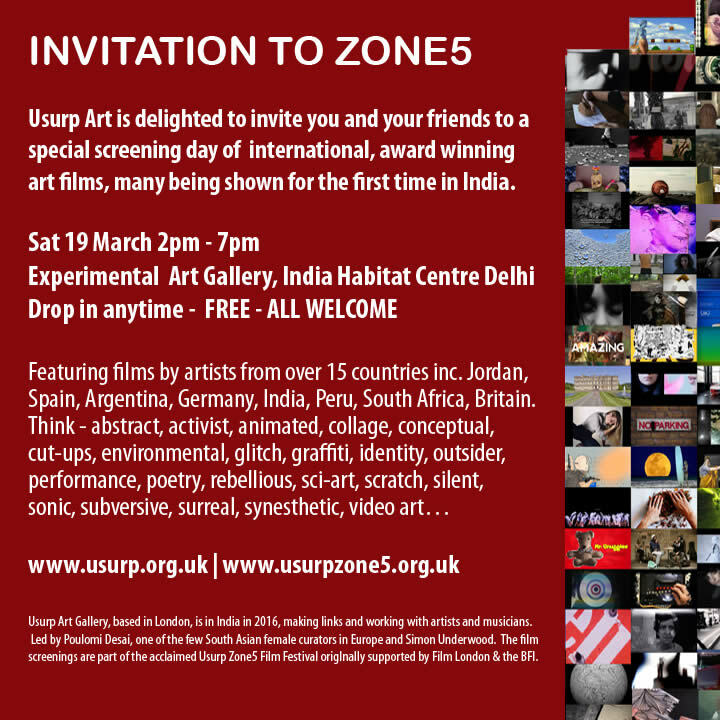 Usurp Zone5 Film Festival is in India for March 2016. A selection of films are being screened in collaboration with film clubs and colleges, and a very special day of screenings has been organised at the India Habitat Centre – see the programmes below. 19 March 2pm – 7pm Experimental Art Gallery, India Habitat Centre, New Delhi. Usurp Art Presents a selection of films from our Zone5 experimental short film festival. Many of the award winning films will be screened for the first time in India. Within – Natália Azevedo Andrade | 3:00 | Portugal. We Are Not Amused – Vicki Bennett | 3:00 | Britain.